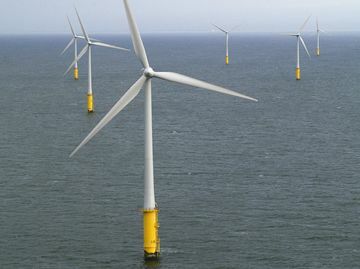 Offshore wind turbines are widespread in Europe, and Ministry of Natural Resource studies indicate they can be constructed in the Great Lakes with little negative impact. However, the province continues to support a ban on the technology. A question raised by many people on either side of the wind turbine is why the turbines must be built on land. Offshore wind farms exist in other parts of the world, and in some ways they seem like an ideal solution to the problem of “not in my backyard.” Ontario boasts thousands of kilometres of shoreline along the Great Lakes and elsewhere, much of it thinly settled and not in specific demand for tourism. Since that time, various reports have been presented to the government, examining the potential effects of water-based turbines on wildlife, terrain and natural processes. The filed reports provide suggestions to reduce the impact of construction. They conclude that turbines built according to these safe practices would have minimal ongoing impact. “If appropriate precautionary measures are taken to avoid or mitigate the impacts of potential harmful or disturbing activities... offshore wind power generation within the Great Lakes has the potential to be implemented with minimal impacts on the aquatic ecosystem and in an environmentally sustainable manner,” reads a report on marine life filed in 2011 by Sarah Nienhuis and Erin Dunlop. Despite these reports, the Liberal government is standing firmly behind their offshore moratorium. The News contacted the Ministry of Natural Resources (MNR) for more information on the conclusion of the filed reports and on ongoing research, and were told to speak with Jim Bradley, Environment Minister and MPP for St. Catharines. When reached for an interview, Bradley initially referred the reporter back to the MNR. When informed that MNR staff had directed enquires to his office, Bradley restated the initial reasons given for the moratorium in 2011. He said European studies are not applicable to Ontario because their wind farms are built in saltwater conditions. In 2008, a plan by Toronto Hydro to install 60 turbines near Scarborough foundered in the face of strong public resistance, before finally being quelled by the provincial moratorium. Another offshore project, proposed by Trillium Power for construction near Kingston, was also quashed by the moratorium, leading to a $2.25 billion lawsuit against the province. That lawsuit was dismissed in 2012, but clearly indicates that corporations are not just interested in land-based turbines. Past inquiries directed to the minister’s office about the results of three complete studies received a blank reply that “science reports are not government policy.” Bradley said his ministry and the MNR needed to continue their research, and await results of ongoing U.S. research in Lake Erie, before making a decision. Bradley is unwilling to hazard a guess as to when that research might be completed.